Introduction: We sought to compare our experience in the 2 primary techniques for buttock augmentation and determine if one is clearly superior to the other from the standpoints of complications, postoperative pain, and patient satisfaction. Materials and Methods: A retrospective search of patient records was performed for the period 2008-2011. A total of 129 patients were identified as having undergone buttock augmentation, 33 via fat transfer with stem cell therapy and 96 by way of silicone prosthesis. Complications were tabulated. Medcalc version 12.1 was used for analysis. Results: Over a 4-year period, we found that a total of 96 implant augmentations had been performed versus 33 fat-grafting augmentations. The overall satisfaction of the patients receiving buttock augmentation was 76.0% (73/96) for augmentation with implants and 69.7% (23/33) for augmentation with fat, which was statistically signiÞ cant (P < .001; 95% confidence interval [CI], 67.9371.47). Seroma formation was more prevalent in the implant group (3.0% versus 17.7%; P = .02; 95% CI, 0.07015.7). Lumps or dents were more prevalent in the fat-grafting group (33.3% versus 2.1%; P < .0001; 95% CI, 17.951.8). Complications isolated to those undergoing implant augmentation included dehiscence (14.6%) and contracture (13.5%). Conclusions: Although fat grafting for buttock augmentation is rising in popularity among surgeons, its results are not as consistent as those seen with buttock implant augmentation. This consistency of results is offset by the risk of capsular contracture and dehiscence, which are seen in implant surgery. Cosmetic surgeons should be aware of both techniques in buttock augmentation and their respective risks and benefits. The human form has always been under scrutiny, but with the advent of the silver screen, cosmetic surgeons has been increasingly charged with the task of refining people’s external appearance. A feature often felt to be a sign of beauty is a round, plump bottom. To fill the needs of our patients, cosmetic surgeons have worked to augment the buttock region with minimal complications and patient dissatisfaction. Buttock enhancement surgery has evolved over time to include augmentation with implants and, most recently, augmentation by fat transfer. We sought to evaluate our experience with the 2 procedures over the past 4 years and to compare outcomes, complications, and patient satisfaction with the 2 procedures. patients were identified as having undergone buttock augmentation, 33 via fat transfer and 96 by way of silicone prosthesis. Complications, postoperative patient pain scores, and patient satisfaction were then tabulated. Medcalc version 12.1 was used for statistical analysis, performing chi square tests for the areas of interest. Both fat grafting and implant surgeries were performed, in all cases, in the manner described in the following section. All patients underwent IV sedation for their operations and none received general anesthesia. neutralize the enzyme. The processed fat, along with the stem cell pellet, is returned to the physician for implantation. The stem cell pellet can potentially contain billions of cells. The processed adipose tissue allows for greater graft take of the stem cells and the remainder of untreated adipose tissue. It has been our experience that this method is rapid and easily reproducible; hence, it is the method by which we have elected to perform stem cell harvesting in our office for patients undergoing fat transfer. Figure 1. 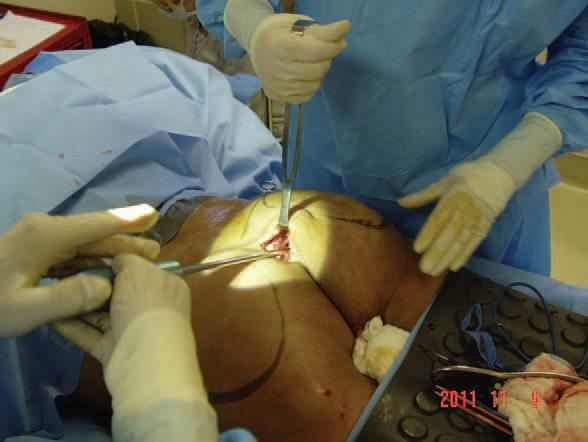 Fat injection into the left buttock using a microcannula. Figure 2. Markings for the site of fat injection for a left buttock augmentation. 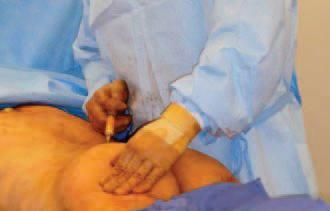 Abdominal fat is aspirated with a 3-mL cannula via a stab incision in the umbilical region. The fat is collected in a sterile collection pouch. Then, the fat is detached from the aspiration apparatus inside the collection pouch and washed multiple times with sterile saline solution. The fat is then placed inside a sterile basin, and the stem cells that were isolated by a technician in the operating room are mixed with the fat cells. No fixed ratio of fat to stem cells is achieved. Whatever stem cells can be isolated by the technician are added to the fat to be injected. The patient is brought to the operating room, placed in supine position, prepped, and draped in the usual manner for a procedure of this type. Then the patient is turned on the abdomen, and the buttocks area is meticulously prepped and draped. The local anesthetic is induced, 1% xylocaine with adrenaline, to both buttocks. An incision is made in the intergluteal fold with a No. 15 Bard-Parker blade, and dissection is conducted to the level of the gluteal fascia. Then the fascia is incised, and the fibers of the gluteus maximus muscle are separated longitudinally with a curved hemostat. A pocket is started with digital dissection underneath the gluteus maximus, and on top of the gluteus medius muscle, the pocket is dissected outward with a spatula dissector and a hockey stick dissector. Figure 3. Markings for gluteal implant positioning and incision made. Figure 4. Dissection of pocket with spatula and hockey stick dissectors. The postoperative instructions for patients undergoing buttock augmentation are the same regardless of the technique used. We recommend that patients stay off their gluteal area for approximately 2 weeks to allow healing to take place. After this point, we ask patients to sleep on their back 2 hours/night for 6 months. This helps keep the implant pocket soft and allows the pocket to be stretched out adequately, particularly in patients with implants. Special dressings are applied to the area postoperatively that are removed on the patient’s first postoperative visit several days after surgery. After approximately 1 month, patients can slowly resume exercise at a less intense pace and are back to normal activity by 6 weeks after surgery. Over a 4-year period, we assessed our experience in buttock augmentation and found that a total of 96 implant augmentations had been performed versus 33 fat-grafting augmentations. (See Tables 1 through 3.) Of these patients, 3 of the 96 patients who received implants had initially received fat grafting with suboptimal results and opted to have an implant augmentation procedure to achieve satisfaction. The overall satisfaction of the patients who underwent buttock augmentation was 76.0% (73/96) for augmentation with implants and 69.7% (23/33) for augmentation with fat transfer. This was found to be statistically significant (P – .001; 95% confidence interval [CI], 67.9371.47). Satisfaction was assessed by asking the patient at the 3-month postoperative visit about their satisfaction with the results of the surgery (ie, yes or no response). Only one case of hematoma formation was found in all patients who received buttock augmentation, and this occurred in the fat-grafting group. This difference in hematoma formation rates was statistically significant (P – .0001; 95% CI, 0.0715.7). Asymmetry was assessed in both groups, but the difference in rates – 6.1% (2/33) in the fat-grafting group and 12.5% (12/96) in the implant group – did not reach statistical significance (P = .10). The asymmetry rate reached a peak in 2009, a year in which 2 patients experienced severe fibrous capsular contracture shortly after surgery, resulting in a slightly higher degree of reported asymmetry. After 2009, we began having our patients sleep on their back 2 hours/night for 6 months beginning at week 2 to decrease the rate of capsular contracture and subsequent asymmetry. There was a statistically significant difference in the percentage of patients who experienced scarring (P = .003; 95% CI, 0.7520.3). The rate of hypertrophic scarring was 1.0% in the implant group (1/96) and 6.1% in the fat-grafting group (2/33). When analyzing the data on postoperative pain, which was rated from a low of 1 to a high of 10 on a 10-point scale, we found that patients undergoing implant augmentation had a higher likelihood of experiencing more postoperative pain; however, this did not reach significance (P = .37). Finally, when looking at lumps and dents, there was a significant difference in patients’ perception of lumps or dents; lumps or dents were noted in 11 of 33 (33.3%) patients undergoing fat grafting versus 2 of 96 (2.1%) patients receiving implant patients (P – .0001; 95% CI, 17.951.8). Lumps or dents were defined as any slight irregularity in the surface of the skin as perceived by the patient and noted in postoperative visits. The irregularities in patients undergoing fat grafting were likely due to excessive placement of fat in a more superficial plane. We then assessed the difference in complication rates between the 2 procedures. We observed an overall infection rate of 12.5% (12/96) in the implant group and 3.0% (1/33) in the fat-transfer group. This trended toward but did not reach signiÞ cance (P = .09). Infection was defined as a positive wound culture amounting to 10^5 colony-forming units (CFUs). Staphylococcus epidermidis was the most commonly found organism, which may reflect contamination from normal skin flora. The rate of seroma formation was 17.7% (17/96) in the implant group and only 3.0% (1/33) in the fat-grafting group. This reached statistical significance (P = .02; 95% CI, 0.0715.7). The rate of hematoma formation was 3.0% (1/33) in the fat-grafting group and 0% in the implant group (P – .0001; 95% CI, 0.0715.7). A large number of implant patients experienced asymmetry (12/96). This rate of 12.5% differed from that of the fat-grafting cohort, which had an asymmetry rate of 6.1% (2/33), but did not reach statistical significance (P = .1). We found that only 1% (1/96) of patients undergoing implant procedures versus 6.1 % (2/33) of patients undergoing fat-grafting procedures experienced hypertrophic scarring. This reached statistical significance at P = .003 (95% CI, 0.7520.3). This difference is likely due to the fact that a large proportion of our patient population is Latino, a population known to have issues with hyperpigmentation because they tend to have a high number on the Fitzpatrick skin-type scale. When looking at postoperative pain, there was no statistically significant difference in patients reporting extreme pain (defined as pain scores of 810 on a 10-point scale) postoperatively: 27.2% (9/33) of patients undergoing fat grafting reported pain scores of 810 versus 20.8% (20/96) of patients in the implant group. When looking at lumps and dents, we noted a significant difference between the two groups. In the fat-grafting group, 33.3% (11/33) reported lumps or dents versus 2.1% (2/96) in the implant group (P – .0001; 95% CI, 17.951.8). In terms of buttock implant augmentation, 3 complications were unique to this subset of patients: implant rejection, capsular contracture, and wound dehiscence. There was only one case of implant rejection requiring implant removal within 2 weeks of surgery. With respect to capsular contracture, there was an overall rate of 13.5% (13/96) over the 4-year period. However, over that period there was a drop in the rate of capsular contracture from an average of 4.5 contractures/ year in 2008 and 2009 versus 2 contractures/year in 2010 and 2011. With respect to wound dehiscence, there was an overall rate of wound dehiscence of 14.6% (14/96) over the 4-year period. However, just as there was a decrease in contracture occurrence, there was also a decrease in wound dehiscence. Over the first 2-year period, there was an average of 5.5 dehiscences/ year. This number dropped to 1.5 dehiscences/ year in 20102011. Of note, 2 patients required implant removal because of notable capsular contracture. 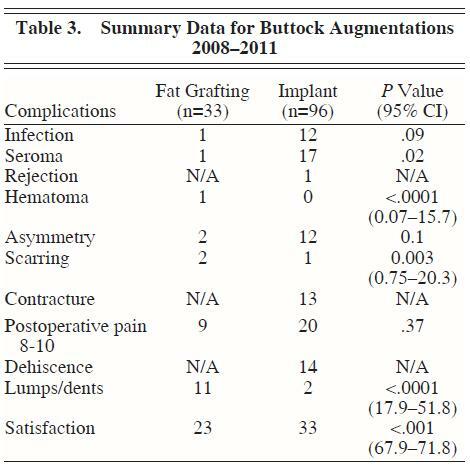 Overall, patients were generally satisfied with the results of buttock augmentation regardless of the technique used. However, a greater proportion of patients were satisfied after implant augmentation versus fat augmentation, and this difference reached statistical signiÞ cance (P – .001). This is likely attributable to 2 factors: (1) there is inconsistency in the rate of fat “take” of patients who receive fat grafting, and (2) at times fat harvesting is inadequate for significant augmentation. In our hands, with the assistance of stem cell therapy, there has been an average of 75-80% take in fat transfer patients, which is consistent with the results obtained in other large studies on autologous fat grafting. However, this is not 100%, and so the result immediately after surgery may not be the final result. For this reason, patients were initially quite satisfied with the result but then had a drop in satisfaction after the 3-month postoperative evaluation as there had been a decrease in the size of augmentation. The second reason for the difference in patient satisfaction with patients who underwent fat grafting is that sometimes a significant augmentation cannot be achieved because the patient has a paucity of fat for harvesting. Some patients believe only a small amount of fat is needed to achieve significant results. However, the amount of fat harvested directly correlates with the amount of augmentation that can be done, and when coupled with a less than 100% fat take, this results in a suboptimal result. We did notice that there was a decrease in the amount of stem cells used in 2010 versus 2011 and attribute this reduction to financial considerations. Some patients elected to undergo fat grafting without stem cell therapy as it had a significantly lower cost. In evaluating the rate of postoperative complications, there was a significant difference in the rate of seroma formation (3% in the fat-grafting group versus 17.7% in the implant group). This difference in seroma formation rates is likely due to the large amount of dissection that is performed in implant augmentation versus simple fat grafting. Literature from Mexico and South America points to an average seroma formation rate of 4% in patients undergoing implants and 6-40% in patients undergoing autologous fat grafting. In our study, a seroma was defined as any fluid collection noted postoperatively after removal of drains. For this reason, perhaps our results are overly inflated. Although many small seromas may resolve without intervention, most require serial aspirations. When large seromas were noted, the buttock region was sterilely prepped, and aspiration was performed using an 18-gauge needle. Although it was never necessary to remove the implant, should a seroma fail to resolve, the surgeon and patient must be prepared for implant removal. The rate of infection was noted to be higher in the implant group, and as mentioned before, this was defined as a positive wound culture with greater than or equal to 10^5 CFUs. The documentation of infection in the chart was not always clear cut and was determined by the reviewer’s evaluation of the patient chart. All patients having suspicion of infection were started on Cipro 500 mg twice daily for 14 days, pending final cultures and possible need for antibiotic modification. Another complication that was statistically significant between the 2 groups was the postoperative formation of lumps or dents (P – .0001; 95% CI, 17.951.8). Of the patients undergoing fat grafting, 33.3% had unsatisfactory results because of lumping in the area of fat injection. This may be due to inconsistency in fat take but it is also likely due to inadvertent injection of fat into the subcutaneous plane rather than directly into the muscle. For this reason that we prefer, as do our patients, the reliable results seen with silicone implant placement. To minimize capsular contracture, we have now developed a sleep regimen for our patients, provide a week-long course of postoperative antibiotics, and continue Jackson-Pratt drainage of the implant pocket until output is minimal. Currently, we ask patients to sleep on their back 2 hours/night for 6 months beginning at week 2. This helps keep the implant pocket soft and allows the pocket to be stretched out adequately. Another complication isolated to implant surgery is wound dehiscence, which we noted at a rate of 14.6%. This result is well within the accepted dehiscence rate of 1430% as described in large series by Mendieta and Gonzalez. In our study, the dehiscences were not complete dehiscences but rather openings of the wound from 1 to 5 cm. These were all managed conservatively with debridement and healing by secondary intention. The risk of dehiscence is one to be aware of as it may require implant removal if the implant is compromised. We have minimized our wound dehiscence rate by paying careful attention to closure in layers and by carefully determining the implant size before surgery. In comparing 2008-2009 to 2010-2011 data, we noted a drop in the number of dehiscences from an average of 5.5/year to 1.5/year. This is due primarily to our change in closure technique. It is currently our practice to close the muscle defect with 2-0 nylon in interrupted fashion, followed by closure of the deep dermis with 3-0 vicryl, and closure of the skin in subcuticular fashion using 4-0 vicryl. Previously, we had not been meticulous in closing the muscle defect and securing it to the deep sacral fascia but modifying our original technique has clearly yielded a lower dehiscence rate. The rate of seroma formation, capsular contracture, and wound dehiscence seemed to directly correlate with larger implants being used in some patients. As the size of the implant increases, there is a greater chance of circulatory and lymphatic compromise. In addition, the larger amount of dissection required to create a larger envelope predisposes the patient to a higher risk of seroma formation and possible wound dehiscence. Finally, a larger implant results in more tension at the wound site, thereby increasing the risk of wound dehiscence. Although fat grafting for buttock augmentation is rising in popularity among surgeons, its results are not as consistent as those seen with buttock augmentation via implant. Our research has definitely pointed toward inconsistency in the results of patients undergoing buttock augmentation with fat grafting. On the other hand, the consistency of results for implant augmentation is offset by the risk of capsular contracture and dehiscence, which are seen only in implant surgery. Regardless of the method of buttock augmentation chosen, surgeons can be confident that the results will be pleasing to the eye and to their patients as long as good surgical technique is used and the aforementioned perioperative risks are kept in mind.